With CINI Australia’s Sponsorships you will support a mother and her baby or a child during his or her education. CINI’s programs reach their whole community and and you will hear about how they are benefiting through progress reports. This unique CINI sponsorship starts by helping a young mother when she most needs it – from early pregnancy until her child is two years old. 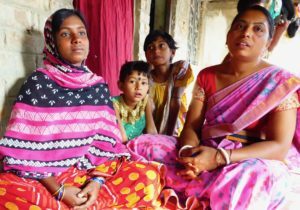 CINI believes that the most effective way to give a child born into a poor family the best start in life is through its mother. Good antenatal care means healthier mothers, better birth weights, good nutrition and stronger resistance to childhood illness. CINI aims for babies to weigh at least 2500gm at birth. In Australia this would be considered under weight but in India this will improve the babies change of surviving. Health workers help mothers to get regular antenatal care, to have a trained birth attendant and continue to help the mother learn about how to care for her baby. A local health worker, or women’s self-help group member, makes regular visits to the mother and her family, encouraging her to increase the nutritional value of her diet using locally available produce. Husbands and mothers-in-law learn the importance of adequate nutrition and support for mothers. This is where the intergenerational change begins as families witness a improved health and survival of babies and mothers. You will receive three reports during this time be able to follow the progress of a young mother and her baby. First, some background information about the mother; then a photo and news after the baby is born and a final report when the baby reaches 2 years 0f age. Your sponsorship will touch not only the young mother’s life, but also that of her child and her larger community. 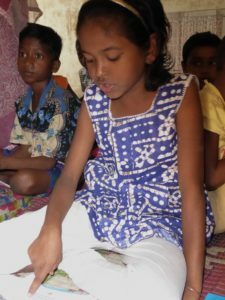 Topsia is one of Kolkata’s an inner city slum districts where CINI’s Urban Unit to works with severely disadvantaged and vulnerable children. Families survive here through leatherwork, rag picking, the tanning industry, bag making and plastic work . This is difficult, low paid work. Education takes second place in the battle to earn an income. Many children are first generation school goers and CINI’s primary objective is that they complete elementary education. These children are eager to learn and even at a young age know that education is an important step on their path out of poverty. Adolescents become role models for younger children and advocates for change in their community. Your contribution will support many more children than the one you sponsor. CINI works in local communities training community teachers and assists under resourced schools to create a child friendly environment. After school education centers mean children get the extra support they need to succeed at school. Community awareness programs ,capacity building and training of community volunteers helps people understand that an education will change the future opportunities of the children. You will receive two reports the child’s progress at school. Educate A Child for either 2 years or ongoing. Preschool programs prepare the children and their families for schooling. The local community and CINI identify difficulties that effect attendance and retention in school. For example, adequate facilities for girl students. These interventions reduce the risk of children having to leave school, becoming child labourers or of being trafficked. Early childhood development; Adolescent girls, trained in preschool play, work with illiterate mothers and their young children to prepare the children for school. This helps them succeed in primary school be more likely to continue to higher. Parents come to see the value of schooling and the adolescent girls share what they have learned about health and nutrition. In return the young women are supported in their own University or Vocational training .